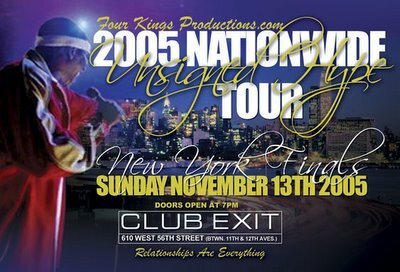 On Sunday November 13 2005 New York will never be the same Four Kings Productions presents the 2005 Nationwide Unsigned Hype New York Finals. This will be the event of the year in the unsigned community! Artist from the tri state area will hit the stage for the final New York Competition. The stakes are high; somebody is going home with a record deal! YES I SAID A RECCORD DEAL!!! We will also be selecting acts for the Unsigned Hype Tour.